As marketers, we know that getting a brand in front of the right audience, in a cost effective manner can be a challenge. As consumers, we are bombarded with marketing messages with little relevance, and trust in traditional media is eroding. The solution? Harness the most trusted and relevant form of advertising: word of mouth. 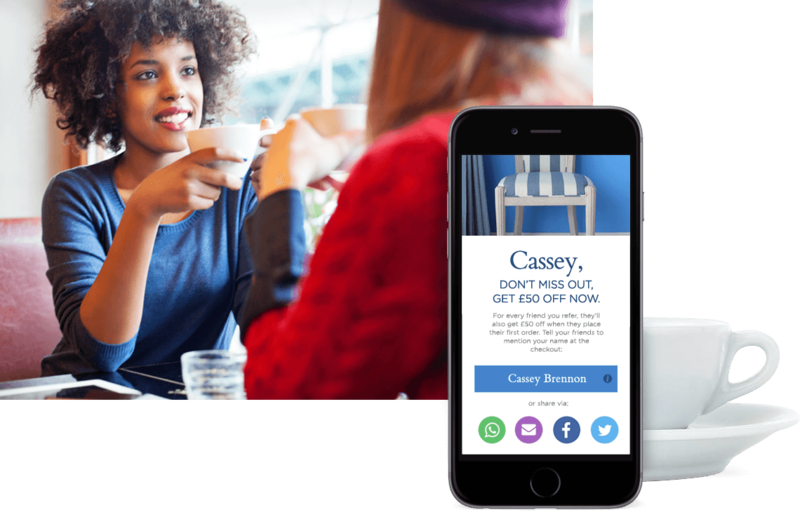 At Mention Me, we have developed a referral marketing platform which provides a market leading solution to ensure refer-a-friend becomes your best performing marketing channel. We enable easy social sharing through email and 16 popular social media channels. But that’s not all. We also know that many recommendations take place in day to day conversations. Not wanting to leave these referrals to chance, we developed our patent pending Share by Name option. No code to remember, no opportunity lost. Did we mention we work on a CPA basis? We know our referral solution delivers results, so you only pay for results. Our team works with clients to put in place a series of tests to optimise their programme and ensure that it achieves exceptional performance. Many of our clients find that referral turns out to be one of their best performing marketing channels. Not only does referral deliver cost efficient customer acquisition, we also find that referred customers have a Life Time Value of 2x that of non-referred customers. We're growing fast - we currently have over 80 employees up from 20 two years ago. Our client and revenue growth is also impressive - we're doubling every year. And in July 2018 we were excited to announce we'd secured $7 million Series A funding, to help fuel our next stage of growth.